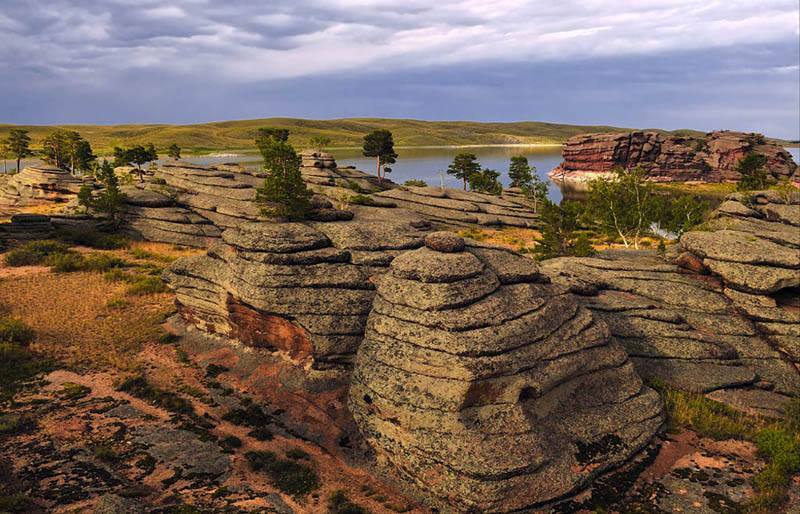 ASTANA – New tourist facilities and attractions are on the drawing board for the Pavlodar region’s Bayanaul National Park. The region’s akimat (administration) is encouraging local entrepreneurs to participate in the Business Road Map 2020 state programme and is planning to create a Department of Tourism. “For the organisation of leisure activities of tourists in the Bayanaul resort area, we are considering the creation of modern entertainment zones such as a rope park, an outdoor climbing wall and fascinating zip-line attraction as a top priority,” said the region’s Business, Trade and Tourism Administration head Dastan Ryspekov at the akimat operational meeting, reported pavlodarnews.kz. Local entrepreneurs are being advised about the Business Roadmap 2020 grant application process to implement the projects. To expand the resort areas, create new routes and attract investors, the administration is planning to establish a Department for Tourism that will work on developing the travel industry for the entire Bayanaul district. “Bayanaul is a popular brand from long ago,” said regional Akim (Governor) Bulat Bakauov at the meeting. “The first thing that restrained the development of tourism in these picturesque places is the condition of the roads. Now, there are good roads. There is good logistics both from the Karaganda and Pavlodar regions. The population of the two regions is more than two million people, which is enough to give Bayanaul a full load, focusing not only on Zhasybai, but also on developing tourism around Toraigyr, Sabandykol and Birzhankol,” he said referring to the four lake in the picturesque district. He stressed one of the main tasks is to prevent the new roads from becoming overloaded with heavy trucks. Additional comfortable housing will be built in the Sultan recreation area on the bank of Zhasybai Lake, said Ryspekov. Zhana Bayan has already constructed one-story holiday houses; however, work has been suspended due to financial problems with the investor. Construction of the Golden Sands recreation area, currently 90 percent complete, has resumed. A beach area, street bar, checkpoint, showers, bath and houses have been commissioned and only internal finishing work remains. The facilities will be ready to accommodate 128 guests by June 1. Approximately 300 million tenge (US$793,200) was invested in Golden Sands in 2018; an additional 40 million tenge (US$105,760) will be earmarked for the project this year. Ryspekov noted the EcoTourist Festival will be held at the traditional Bayanaul summer season opening ceremony. The participants will live in a tent camp and compete in rock climbing and singing and participate in clay and felt workshops. The Hover Air Festival, with a parade of balloons and a children’s kite competition, is also on the schedule. Approximately 200,000 tourists visit Bayanaul every year. In winter, those interested in outdoor activities enjoy Bayanaul Winter Fest.